American-style eats with a tropical twist await travelers who journey into this dense, animal-filled jungle. Gather your party of explorers on a trek into the Amazon, where you’ll dine in the company of animated animals to the sounds of thunder claps and sudden rainstorms. 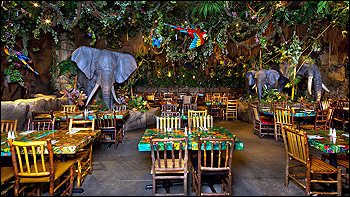 Singing birds, trumpeting elephants, chest-pounding gorillas and schools of brightly colored fish welcome you to a lushly landscaped jungle of tropical vegetation, banyan trees, waterfalls and a starry nighttime sky. Feel far away yet at home all at once with American-style eats the whole family will love. Then swing by the Rainforest Cafe shop, where you can pick up plush animals, themed apparel and tropical trinkets to commemorate your Amazon adventure. Chimi-Cha-Chas, Crustacean Crab Dip, Cheese Sticks, Chicken Strips, Guacamole. Lettuce, tomato, pickle, cheese, topped with a fried onion ring, choice of a side. Two patties, lettuce, tomato, pickle, cheese, topped with a friend onion ring, choice of a side. Dark chocolate cake layered with rich chocolate filling, served with raspberry sauce and creamy whipped topping! Dinosaur-shaped chicken nuggets served with choice of side and drink. A frozen blend of ICEE flavors layered in our collectible souvenir cup. Keep the cup!